Traditional Materials takes great pride in the salvaging on materials sought in Europe. 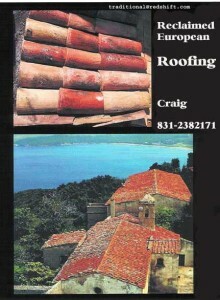 We tend to think of these materials as treasures that absolutely cannot go to waste and value the roofers and artisans that laid the original terra cotta roofing. 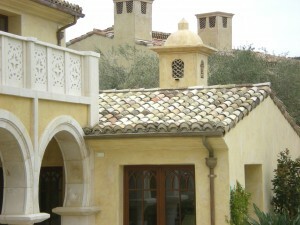 Traditional Materials has decades of experience and a well deserved national reputation for providing the very finest reclaimed terra cotta roofing, architectural materials and reproductions. We maintain the highest standards of integrity and customer service and provide the very best wholesale prices. As a client, you will be dealing with the source that reclaims these materials from old buildings, villas, and estates throughout the world and we maintain one of the largest inventories in the industry. We guarantee delivery and are very sensitive to meeting client’s time schedules. 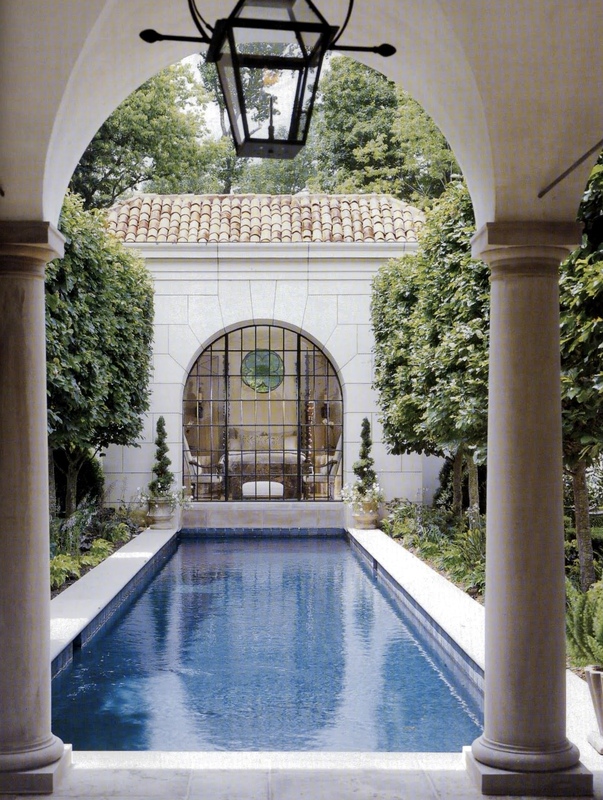 We have the finest most experienced stone carvers and design team skilled at reproducing flooring, fountains, fireplaces, as well as rustic garden elements. From our years of experience we have created unmatched techniques in developing the patina of the “aged” appearance on newly acquired stone and wood flooring. We invite you to contact us and to visit our showrooms. Reclaimed Terra Cotta Roofing and European terra cotta flooring reflect the charm and characters of the clay from the specific region and area of the countries they originated from. All across the mediterranean regions since Roman times, these hand made terra cotta clay tiles have given patina to new homes now being built. All salvaged reclaimed terra cotta roofing adds charm to any finished project. 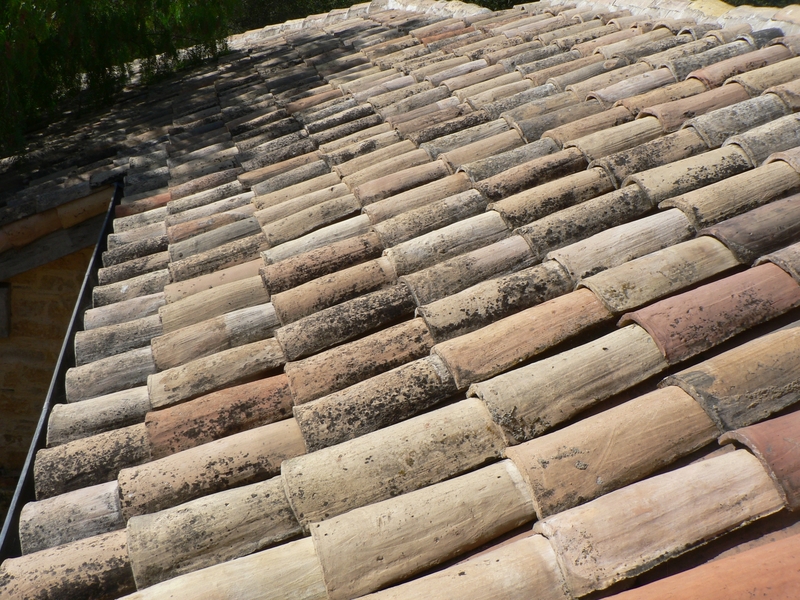 Since Roman and Greek times these roofs throughout the French Bordeaux and Provence tiles (tuiles) from Andalucia Spain (tajas) and Portugal from Northern and Southern Italy (copo): Colors, all reds & roses to buffs, ochres, yellows, creams and deep pinks. Please feel free to call us to discuss future projects, have a question on materials, have a question on themes for building and / or types of architectural elements. Our representatives will gladly help you with anything you need. ITALIAN RED ROOFING BARRELS & CUPS (COPO) Measurements:17 +/-inch long, width 6+/-inch, 2+/- inch profile cup. 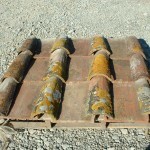 COVERAGE: About 250 +/- roof tiles per roofing square, or 2.5 tiles per sq. foot. Colors:Reds/roses as shown or also available in Mediterranean mix of yellows, roses, ochres, peaches, creams and buff colors. WEIGHT:2.3 +/- lbs per tile. All tiles vary from one tile to the other since they are all individually hand made. It has been since the Roman times that terra cotta has been used to make roofs, as well as floor tiles in the decoration and integral building of structures both residential and commercial. After older buildings have been dismantled we import these tiles from all areas of Italy from Tuscany, Rome,Venice, Adriatic, and southern Italy. 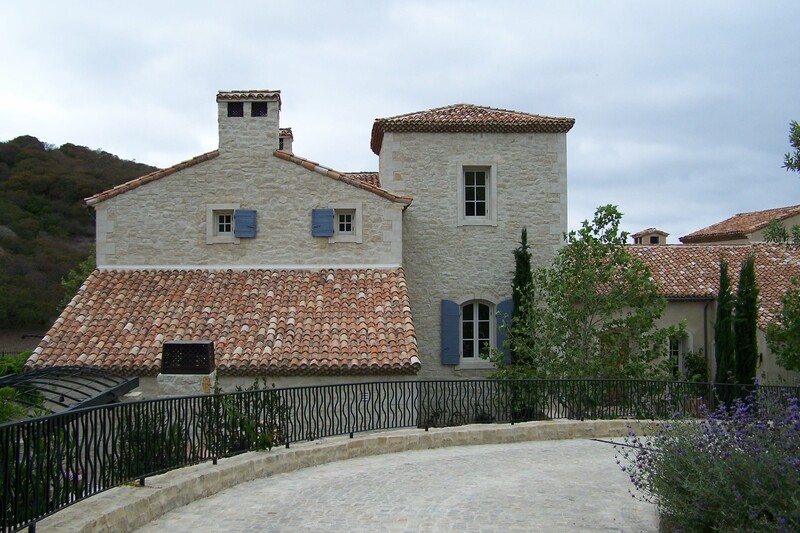 Hundreds of years of weather changing conditions add to the patina and charm of this wonderful reclaimed terra cotta roofing and flooring clay product that new roofing cannot duplicate. The wonderful red and rose color cups (Coppo) and barrels are reclaimed and carefully salvaged roofing come from a few areas in the south of Italy. One such town is Asolo, not far from Venice, about 48 mile north of Padua. Asolo is known as the place and “town of a 100 Horizons” because of it fabulous panoramic vantage points and unbelievable beautiful views. This is a wonderful area to visit with old history and charm with influence from the Greeks, Romans, and Turks. It is from this area that we source recycled and antique red roofing coppo from houses, farms, large villas and estates that are also being carefully dismantled for: reclaimed terra cotta roofing, wood beams, fireplaces, doors, stone surrounds, wood reclaimed flooring, stone flooring, garden elements, wrought iron gates and lighting fixtures, fountains, troughs, planters, sundials, cobblestone, bricks, marble flooring, terra cotta floors, and old building stones. 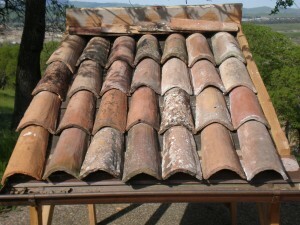 Traditional Materials’ Reclaimed Terra Cotta Roofing Tiles – Tegola Italian Flat Pans: It is true that since the Roman times ( 44BC- 1453AD ), terra cotta has been used to make roofing and flooring tiles, and masterworks such as the olive jars (Orci), lemon pots / orange pots (Conche) and statues used in the construction and the decoration of European Villas and farmhouses. The distinguishing characteristic of this clay (Argilla) is represented by its unique range of soft warm colors. Terra cotta clay roofing barrels measure in 2 major different sizes 16+/-in long and approximately 18 inch long in either reds or all yellow, ochre, cream colors. Our roofers use about 250 pieces per roofing square which equates to about 2.5 pieces per square foot. All of our reclaimed, recycled, antique, and reused roofing canbe used in conjunction with our new Spanish,Italian, French barrels or barrels made by U.S. companies. 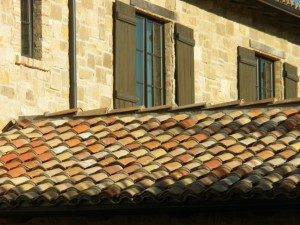 Traditional Materials imports fine reclaimed Italian/ French Terra Cotta roof tiles directly from France, Tuscany & Northern Italy. The consistency and patina and the range of forgiving warm colors adds a unique feel to any estate or property. 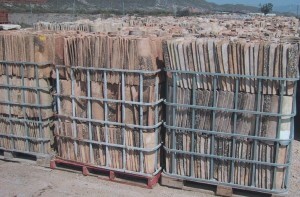 The century old hand -made roof-tiles are carefully selected wrapped & crated before shipping. Barrels in Italian are called Coppo. The Flat- pans are known in Italian as Tegola. This term come from primarily the Tuscan region Italy the peninsula and the Mediterranean area Italy. These materials are over 100 years old and every pieces was HAND MADE. ITALIAN BARREL’S & FLAT PANS New Roofing: Traditional Materials imports new or Reproduction Terra Cotta roof tiles manufactured in both Italy & France. New natural clay roof-tiles are manufactured according to tradition and the utmost highest standards, available in various sizes, colors and patina. Ask your TM reclaimed specialist concerning these. 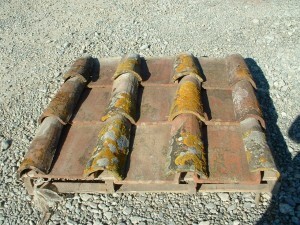 French Flat Roofing French Flat roofing from the area of Normandy France where the roofing derived its name. Sizing: Tiles are about 1/2 inch+/-thick 10 – 11 inch long 6- 7 inches wide. The Normandy architecture is famous world- wide.This roof style is known only from France but is copied in other areas of the globe in other countries and is reproduced both in France, England and the United states. Roofing from red reclaimed terra cotta roof tiles indigenous to the Northern France area is different of course from the flat slate roofing made famous and used extensively in the British Isles of England, Wales and Ireland and Scotland and Northern Europe. 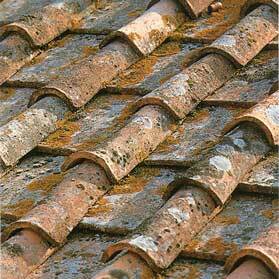 Note the complete contrast to the Barrel or Copo of Tuscan style roofing known from Portugal & Spain. MEDITERRANEAN MIX COLOR ROOFING from Southern Italy: Color is peach, ochre yellows and oranges variations and from 10 to 20% reds always mixed combination of colors which makes them so popular with architects AIA, designers, builders & roofing companies. COPPO weigh about 2.3 lbs each.size is about 5.5inc wide at the small base end and about 7.5 inches wide are the larger base end… Tegola flat pan is tapered. TEGOLA or flat pan in Italian are ( 9+/-) at small base end and 14 +/_wide approximately at large base end by about 18 – 20 inches long and weigh (+/- 3) lbs each. 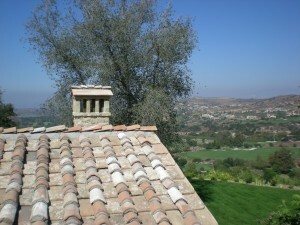 TUSCAN ROOFING is always red in color. Measurements per roofing square range from approx 185 – 260 pieces of roofing per roofing square. The larger the tile the less needed to cover the roof. 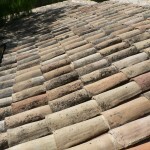 The colors inherent and integral to the clay tiles changes and matures and antiques with more character as the years go by Hundreds of years of weather changing conditions make these tiles a “one of a kind” great reclaimed antiqued look. 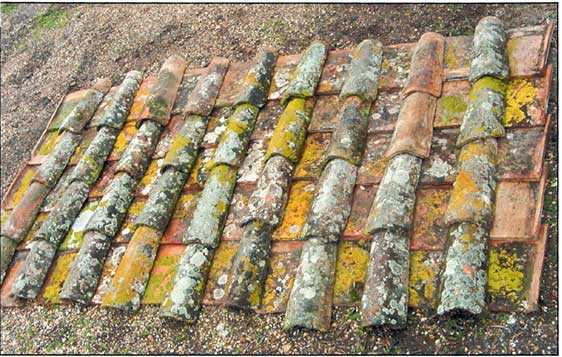 Many times we reclaim and provide these tiles with moss, lichen, and previous growth on them, particularly where there existed a lot of moisture on the roofs. Mediterranean mix with flat pan for bottoms and Coppo barrels Tops for the tops over the flat pans and Barrel or Coppos for the Tops are about 120 per roofing square, for a total of about 240 or more tiles per roofing square. 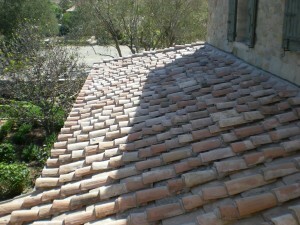 Tuscan Red: Flat pan for bottom layer about 90 flat pans per roof square and barrel. 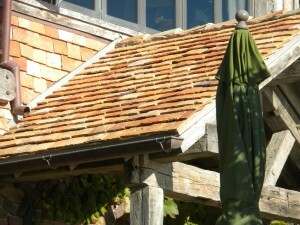 Coppo top in combination (as shown in pictures) 110 barrel tiles per roof sq. for a TOTAL of about 210 or more per roofing square. Coverage of tiles per square foot or quantities will vary and always the on clients, designers, architects and /or roofers purchase enough tiles to make a sample and then have the qualified roofing company determine the quantities required for the job. 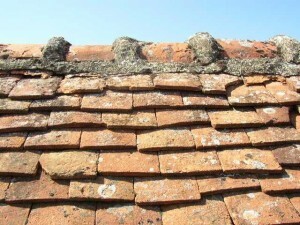 Although Traditional Materials, maintains a large stock of reclaimed roofing from Italy, Spain Portugal France and Eastern Europe as well as Latin America. It is recommended that clients order this material at least 3 to 4 months ahead of when the roof needs to arrive on the job site or load the roof. 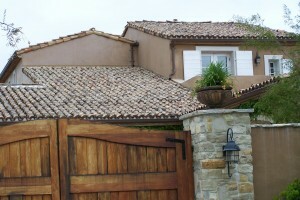 ITALIAN CUPS & BARRELS (Copos) MEDITERRANEAN ROOFING: Made from a mixture of colors of terra cotta from Southern Italy. 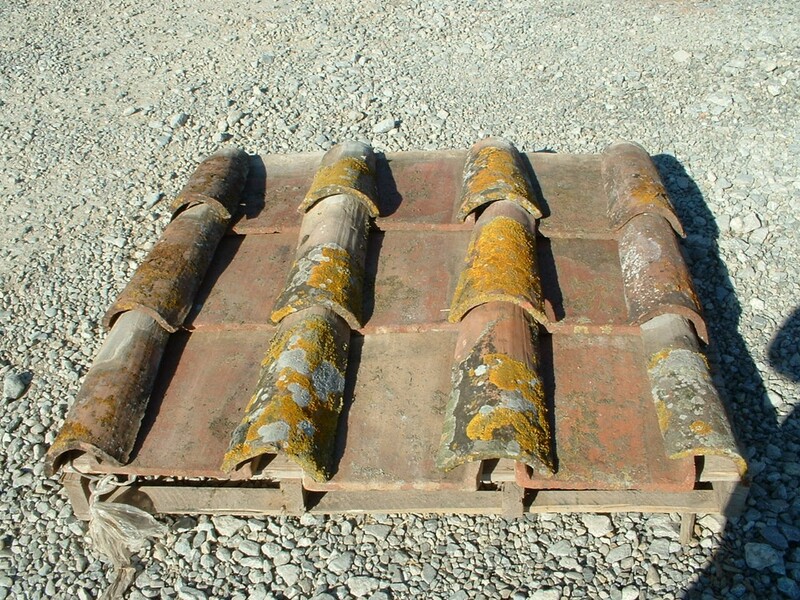 This reclaimed roofing is known the world over by architects, designers and builders and is imported especially to the United States for high end residential and commercial projects. This roofing is truly one of the most recognizable and beautiful architectural features and elements and statements from Italy. We like to say that: A RECLAIMED ROOF IS LIKE A FINE HAT ON A BEAUTIFUL WOMEN In a mixture of colors of ochre, yellows, roses, creams and reds from the terra cotta clay indigenous of Southern Italy and other countries bordering the northern Mediterranean, such as Spain and France. RED MEDITERRANEAN MIX Measurements: 2 major sizes: 16+/- inch to 18+/- inches long, and widths of 5+/-inch to 7+/- inches wide depending on the villages and area they were made. Since they were all hand made and molded by Italian artisans, typically over their leg they will vary slightly from villa estates to barns and farm houses and from town to town, and from area to area.Coverage: We estimate about 250 roof tiles per roofing square for barrel/tops & barrel/ bottoms. We recommend that the roofer determine quantities to be ordered for the individual job since overlap, ridges, eves all determine quantity of roofing per square. Colors: mixed colors of rose, reds, ochre’s, yellows, creams, oranges, peach and buffs. Patina: all old carefully reclaimed and sorted as to texture, size, colors, and patina. All naturally aged by weather and the sun, some with lichens and some not, depending on area of the structure. 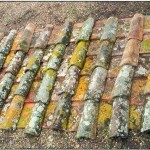 Pans: or lower “bottoms” can be used by simply turning the tile upside down as is accomplished with an all reclaimed roof. However, new roof tiles made in Italy or the United States can be substituted for the “pans” and, thereby, normally save money and achieve more economy. However, for a better look, the various different courses known as “ridges” and “eaves” are best suited for both tops (cups/barrels) and pans to be all reclaimed. Caps: These barrel or terra cotta Caps or “cup roofing” is called in Italian “Tetto con i Coppi” and is commonly known in Italy as Coppo which means barrel. Durability: Some centuries old have withstood time and weather conditions. Because of the high contents of iron in the clay (argilla) used to make the tiles and the high fire temperatures in making them they are very durable especially against inclement weather.We often see the artisan’s imprints of fingers or hand prints on the individual tiles. Disassembling: We very carefully disassemble (smontati), sort, and package and crate for shipping to the United States and other countries. All containers of “Tetto” and other terra cotta floor tiles are fumigated against bug infestation and ready to be installed once transported and delivered to the job site by our professional truckers.